Honeymoon Wishes : A honeymoon is the most remarkable first trip of a newly married couple. Also, it’s the most precious period for this wedded pair’s life. As they are starting a conjugal life they get worthy of attention from their well-wishers, friends, family, colleagues and well-known persons. When any of your friend or well-known has met the opportunity and get starts for a happy honeymoon then you should congratulate and wish them. 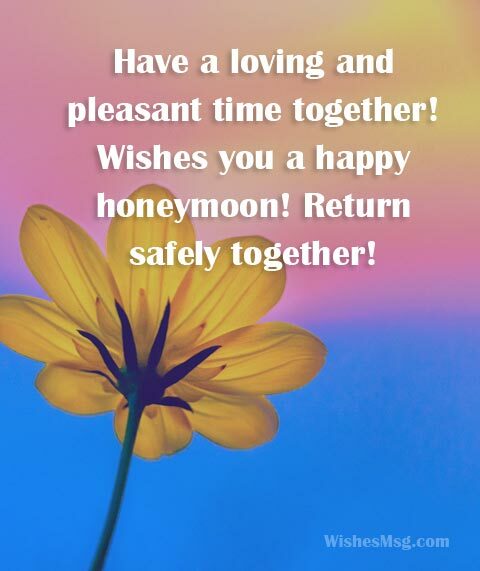 Find a cute and best honeymoon wishes messages from our collection to great a just married couple for a happy and sweet honeymoon. A Honeymoon is the time for a couple when they drowning in love and want to forget rest of the world! I hope you’ll discover your love, care, warmth, affection in your honeymoon. Have a happy honeymoon! May the beautiful honeymoon place become more beautiful for your presence! Walk together by the sea hand in hand. Filter the old beautiful memories. Take care both of you and your cute relationship! May the first vacation of you two as a newly married couple be the most beautiful honeymoon. It is the most beautiful time to know each other, to understand each other! Wishing you days full of warmth and love! 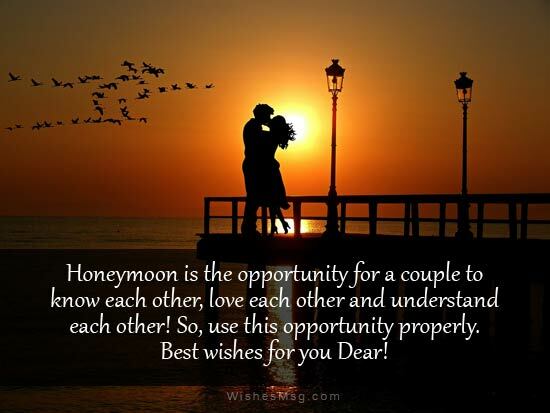 A honeymoon is an opportunity for a couple to know each other, love each other and understand each other! So, use this opportunity properly. Best wishes to you Dear! I think no marriage is complete without an exotic, romantic and unforgettable honeymoon! It’s the second step of marriage. Enjoy the beautiful moment together. Be happy always! The Honeymoon will never come back in your life. So enjoy every single moment of your conjugal life! Show your soul mate that how special he/she is! Have a beautiful honeymoon and come back with beautiful memories. Wishing you a romantic time! Dear, beautiful couple, wishing you a full of love, romantic and cheerful honeymoon! Spend special time with your soul mate and must make this time more memorable. Have a great vacation time dear! Every time you don’t need a special place for love. But the thing that you need most is love, care, and togetherness! 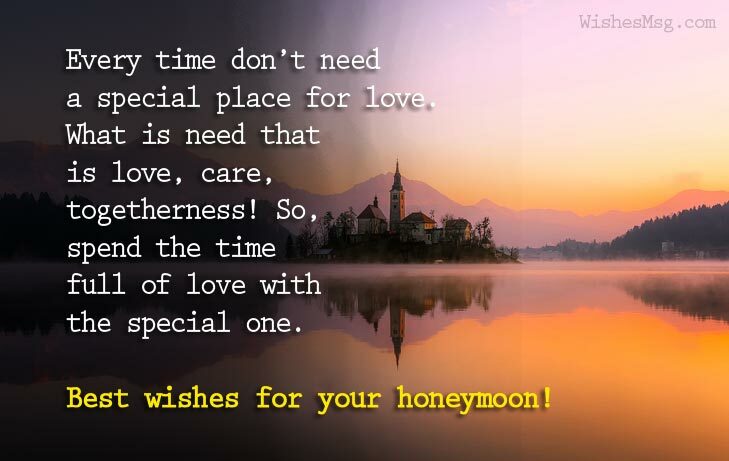 So, spend the time full of love with the special one. Best wishes for both of you! May the place will welcome you with arms wide open of affection. Ride your journey through the sea of love with your better half. You are looking like made for each other! Have a happy honeymoon! I become very glad to hear about your marriage ceremony. You are so lucky and now it’s time to go honeymoon. Make every single moment more memorable during the honeymoon. Enjoy with your beloved one! Dear, get ready for some romantic getaway. Because it’s honeymoon time. Which means time for enjoyment. So, enjoy whole the time! Wishing you a very happy honeymoon! I wish honeymoon will cover all of your gaps with love, affections, attachment among each other. Your honeymoon will be the happiest holiday you had ever enjoy. Best wishes for the world’s best beautiful couple! When you go to honeymoon you’ll find yourself newly. All the time only for yours dear! So, discover the internal you and your soul mate with love! Make a lot of beautiful memory. Best wishes to you both! The heavenly ride is beginning soon as a couple of husband and wife. I hope you’ll enjoy all the moment with full of love and romance. Wishes you a happy honeymoon! I wish that honeymoon is the most romantic trip of yours than other. You are the cute couple I had ever seen. Wishes for your honeymoon. And I hope you’ll come back with full of energy and a lot of precious moment. Best of luck! The honeymoon is simply a holiday but a most special holiday. Wishing your honeymoon become the most beautiful holiday of your life! Enjoy your honeymoon! Dear, have a safe honeymoon and safe trip. All the best both of you! A honeymoon is the best time to find each other, hold hand and enjoy the moment. Enjoy with your better half as more as possible. Because it’s a true relationship. Wish you a happy honeymoon! Take this time to truly enjoy each other’s company. May your honeymoon begin and never end! Have a wonderful honeymoon trip. I look forward to your return. God blessed you both! Happy honeymoon wishes for both of you. I hope you’ll be together forever and be happy always! I wish you both to fall in love again and again. You are the cutest couple! Happy honeymoon dear! Make your honeymoon most memorable! Best wishes for both! A honeymoon is the second step of marriage. So, I’ll tell you to enjoy every step of marriage. It’s a true relationship. Take care of each other! Wish you all the best, Mr. and Mrs.! Dear, how are you right now? I hope the answer is very positive. Because you are now flying in the heaven! Right? Enjoy every moment of your honeymoon! Wishes you Good luck for the rest! Have a loving and pleasant time together! Wishes you a happy honeymoon! Mr. and Mrs. return safely together! The Honeymoon is just the beginning of love. I wish rest of the life you’ll stay together and love each other as like your first honeymoon. Enjoy your honeymoon as much as possible! wishing you a very romantic honeymoon! You may send these honeymoon wishes messages to the bride and groom via Facebook, Twiter, Email, Google Plus or using other social media. Also, the cohabitant may expect a honeymoon greetings card from you. So, it will be awesome if you send a note or card attaching a sweet honeymoon message from this post.